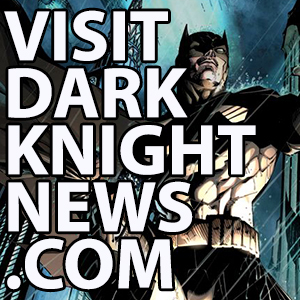 HomeNewsDC Comic Book NewsReview: Action Comics #42. Action Comics #42. Story- Greg Pak & Aaron Kuder, Words- Pak, Art- Kuder, Colors- Tomeu Morey, Hi-Fi & Blond. 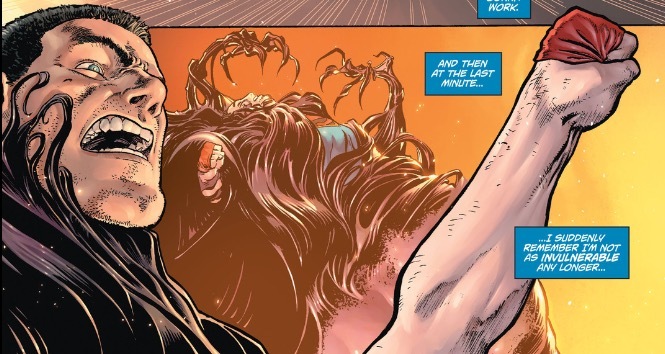 The tagline of the DC YOU is that “there’s a story for every kind of DC Comics fan.” I’m scratching my head as I ponder this point while having just read Action Comics #42. 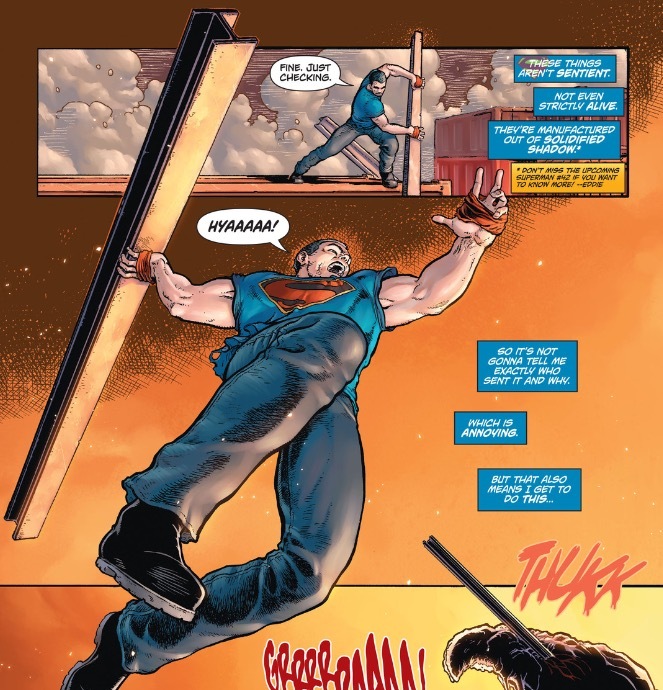 The notion that comes to mind immediately is a sarcastic, “Well, I guess Action Comics isn’t the story for Superman fans.” With that said, it’s important to note that Superman has undergone some drastic changes over the years, some gradual and organic and other rather quick and contrived. The latter changes have tended to be about re-igniting interest in a character that has the longest history in super-hero comics. For a long time this wasn’t a problem, but sometime in the middle to late 1960’s, Superman all of a sudden wasn’t the most excited character in comics. He’d fairly recently beaten one Marvel- Fawcett’s Captain Marvel in the courts, but Marvel Comics was another story, and he didn’t fair so well. To this day DC is playing second fiddle to their until very recently cross-town rival at the House of Ideas. With the DC YOU we see another attempt at re-imagining Superman. While there certainly seem to be elements in this approach that seem interesting and note worthy, the actual execution comes off as something that seems to twist away from one’s basic notions of the character and his relationship to the city of Metropolis and its infrastructure. The head neighbor, a firefighter does her best Gandhi impersonation to try and keep heads cool, and it works for the most part. 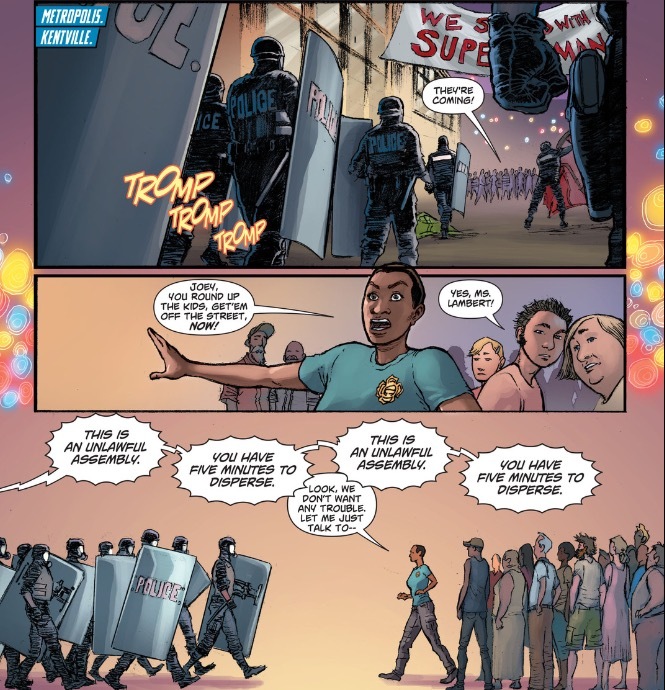 Superman finally shows up to lend his peaceful resistance to the fight. 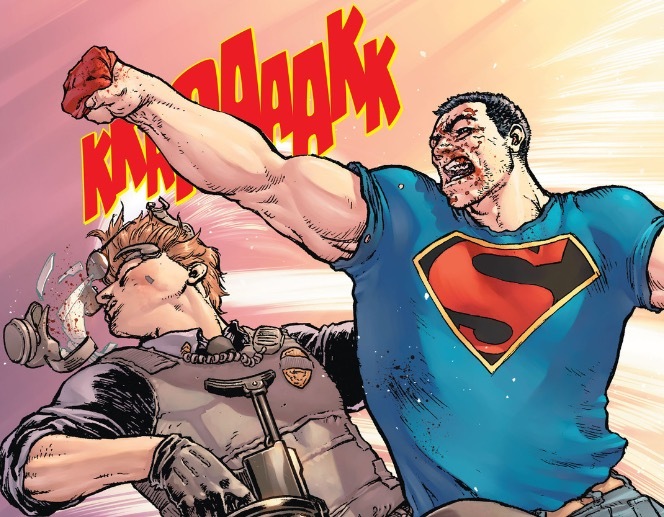 The cops just want to beat him up so this just leads to Superman eventually losing his cool and decking the head cop- hard. While I feel like I should be cheering this, the whole situation is so awkward and convoluted it comes off like watching a wreck in an automobile. It’s a terrible thing but you can’t look away, and then you wish you did. Whew, this is tough. 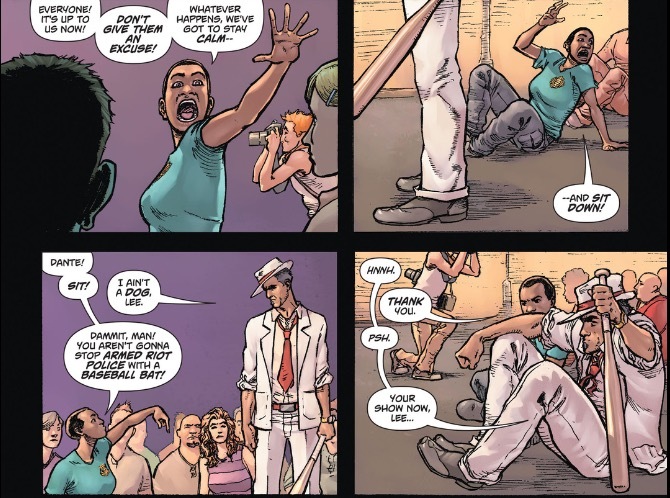 Even the normally reliable Aaron Kuder is hit or miss page to page and panel to panel. And Pak, who’s written some nice Superman stuff in recent years is not making me believe. Was that a positive? Oh, sorry. 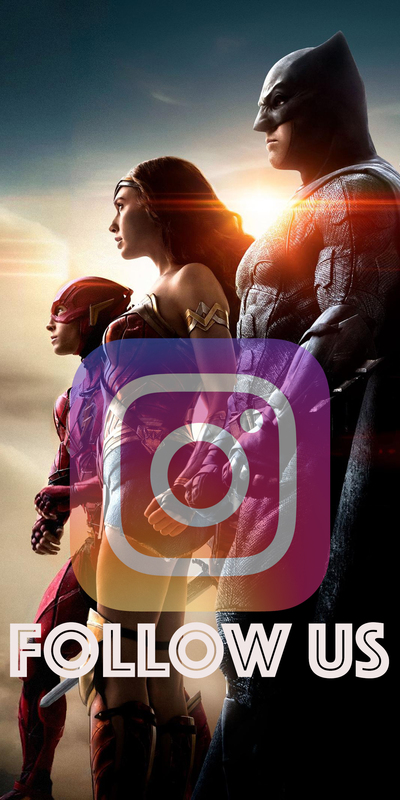 Conceptually, I can imagine a depowered Man of Steel who is taken back to his original New 52 T-shirt and jeans approach as an exciting new direction. There is definitely a great idea here. Absolutely. Definitely. Yes. Yes! I almost don’t know where to begin. Almost everything was awful. 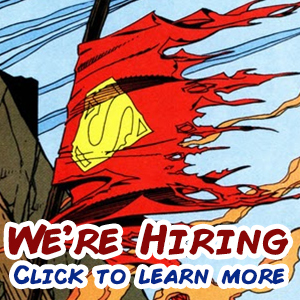 The mistiming of Action Comics and Superman is a huge editorial gaff. It’s almost comical. The portrayal of Clark seems way off. I get that this is a New Direction and sort of a soft reboot, but I had a hard time recognizing Superman in this issue. There were a few moments as he tries to convince the cops to back off, but not nearly enough to make me believe. His internal monologue is difficult to read. It just doesn’t ring true as Superman’s voice. The cops’ motivation was hard to understand as well. While I can imagine their frustration at feeling passed over by the public as the protectors of Metropolis in lieu of Superman, it’s such an alien concept to the Superman mythos, it just didn’t ring true. Maybe these guys are being mind controlled. Will the real Superman please stand up? I want to get in a Legion time bubble and go into the future when all this nonsense is over. Or bring back the digital first Adventures of Superman title. It’s not so much that they’ve outed Superman as Clark, but that nothing feels right about the execution. It doesn’t feel like this is how it would go down. 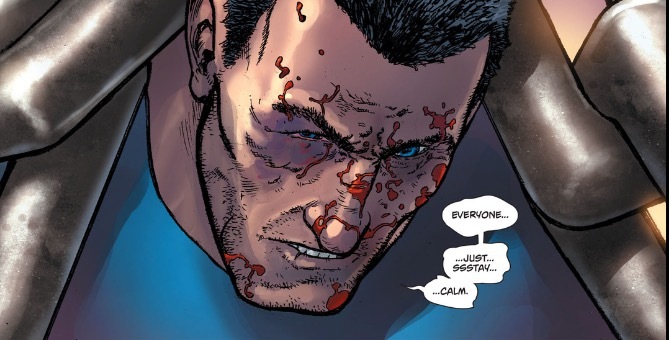 Superman will never feel “right” if portrayed as edgy or dangerous. Instead of the world learning the secret identity of it’s greatest hero, it feels like Superman is an untrustworthy public figure who’s finally been exposed. Oh, yeah- Luthor.